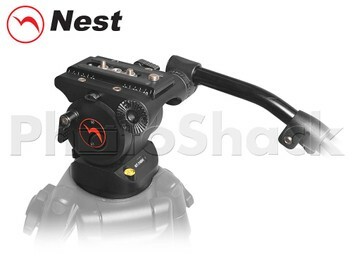 The Nest NT-740H Fluid Tripod Head is a lightweight systematic video head mounted with a 75mm globe, for the latest digital one-piece DV camcorders and DSLRs. A Globe mounted tripod head is the quickest way to level the camera on uneven ground. Its Fluid Dampening helps keep your pans and tilts smooth and jitter free and a one-step Counterbalance adds a bit of rebound to the head assisting your camera back to center. Combined with its Superior build quality, the Nest NT-740H is your first affordable step to a Professional production level. At PHOTOSHACK we pride ourselves on quality photographic accessories, fast delivery & the ultimate ONLINE shopping experience. With over 20 years of professional photography "shooting" experience in NZ, PHOTOSHACK is able to support and inform you on the right products & techniques for your photographic accessory requirements. Images and script subject to copyright Photoshack 2014.